We’ve had quite a few “scoahchahs” during the month of August but the first real cold front of Fall arrived in the early morning hours of 22nd August, bringing the first taste of cooler weather to come. We’re now well on our way towards Autumn, and by the time you read this, it will be in the meteorological world. Meteorological Fall arrives in the Northern Hemisphere on the 1st of September and encompasses SeptemAber, October and November. With that in mind, this month’s column will be Summer’s last stand and will discuss some of the unusual cloud formations associated with thunderstorms. The first cloud I will talk about is the thunder cloud itself. Thunder clouds are known as Cumulonimbus (cumulus for lumpy, nimbus for rain). Their bases depend on the day but are usually between 3,000 and 6,000 feet off the ground. Cumulonimbus clouds can grow really, really tall. In the Midwest and Southeast where thunderstorms are strongest, the tops of the largest will extend over 80,000 feet above the ground. In Maine, our strongest storms usually make it to about 50,000 feet in the air. This difference is due to the lack of the super high octane fuel you can find in the SE and Midwest. 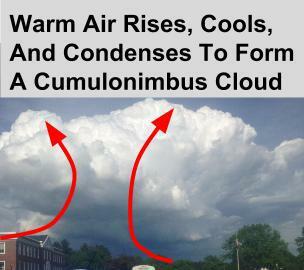 There are three main parts of a cumulonimbus cloud, the upper part, the middle part, and the lower part. I’ll talk most about the lower part because that’s where most of the clouds unique to thunderstorms happen. The first and most common special cloud that thunderstorms produce is the shelf cloud. Shelf clouds look like an alien spaceship that’s about to sweep you off to another planet. In reality, they’re just marking the leading edge of cooler air and letting you know that it’s about to get really windy. How do they form? When rain falls, it cools the air through a process known as evaporational cooling. This happens when the water in raindrops evaporates, changing from a liquid to a gas. Gas molecules contain more energy than liquid molecules which means that for the evaporation to work, some energy must be put into the liquid molecules so that they can be gas molecules. Because energy is conserved, something has to lose energy for this to work. The air surrounding the raindrops is what loses the energy. As it loses energy, it cools because cooler air, by definition, has less energy than warmer air. All that to say that when rain begins to fall during a thunderstorm, it creates a pool of cold air. Cold air is dense and likes to sink towards the ground along with all the raindrops. When the cold pool arrives at the ground, it can’t sink anymore so it spreads out. Along the leading edge of the advancing cold air, the warm air that is fueling the thunderstorm is forced to rise, cool, and condense. 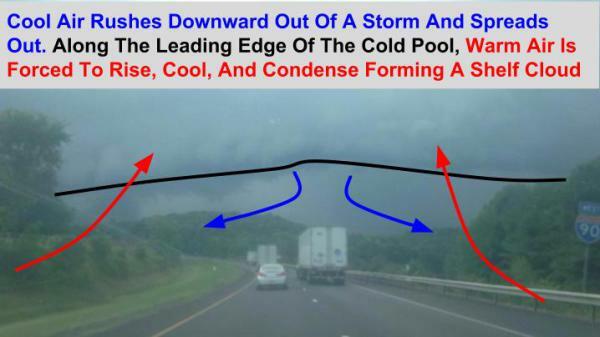 This is what causes a shelf cloud. The second type of cloud that is sometimes seen near the base of thunderstorms is known as scud. It looks scary and tornado-like sometimes but is really just harmless. 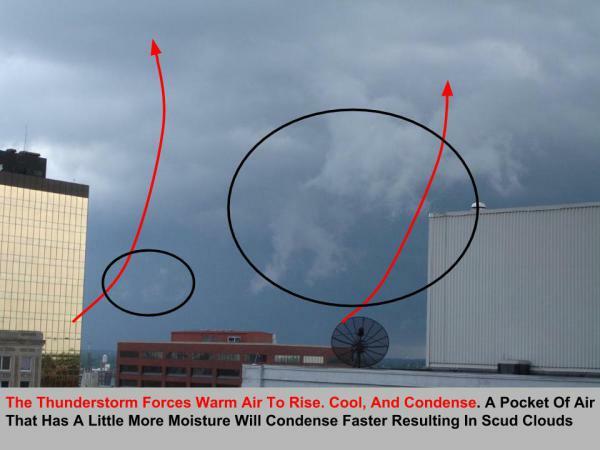 Scud happens when pockets of air that have slightly more moisture than their surroundings are sucked upwards by the storm and because they have more moisture, they condense before they reach the bottom of the main cumulonimbus cloud. They form close to the ground and then rise until they are absorbed into the main cloud formation. funnel clouds, are rapidly rotating and rising columns of air. A tornado is simply a funnel cloud that has touched the ground — that’s the only difference. Air condenses in the column because it is rising really fast. It rises so fast that it creates an area of really low pressure at the centre of the column. The destructive winds associated with tornadoes are a result of surrounding air trying to fill that “hole” in the atmosphere. Thankfully, we don’t often see tornadoes in Maine, but they have been known to happen. The final neat thunderstorm cloud that I’ll discuss here is known as Mammatus. Mammatus clouds form along the bottom edge of the anvil of thunderstorms. They are unusual in a number of ways. First and foremost, they form from air sinking, not rising like almost every other type of cloud. 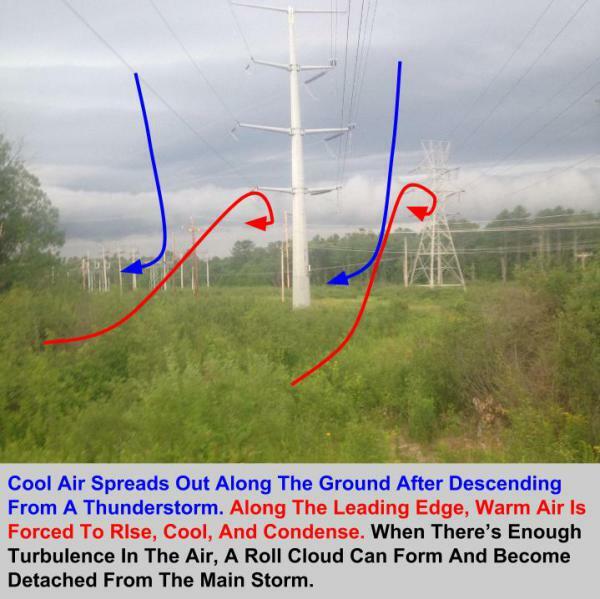 After air rises in the updraft of a thunderstorm, it spreads out at the top of the troposphere and then must come down at some point. This sinking air is what causes mammatus. Air that sinks warms as it does so, which usually removes the air from its condensation point. However, in the air that forms mammatus clouds, there are lots of snow and ice crystals. As the air begins to sink, it warms. That warming melts the snow and ice. However, since energy is conserved, the energy required to break the bonds of the solid water is removed from the air surrounding it. As that energy is removed from the air, it cools, bringing the temp back to the saturation point and thus forming a cloud. The air will continue to sink as it cools, because remember cool air is denser and heavier than warm air, and eventually all the solid ice crystals will melt and the cloud will evaporate. However, in big thunderstorms, the supply of ice crystals is constantly being replenished as more air rises, cools, and condenses. This allows mammatus to appear suspended for long periods of time because air entering at the top brings new ice crystals which melt in the cloud before that air moves out the bottom full of liquid that has no power to cool and thus condense. This whole cycle won’t create a cloud unless more energy can be removed from the air due to the melting than can be put into the air from it sinking. This situation happens very rarely, and almost never in Maine, but is absolutely stunning when it does happen. And on that note, I’ll say that’s it for this month. Next month we’re on to Fall. By the time you’re reading my next column, the snow guns at Sunday River will already (hopefully) have been fired up for their first test, which happens as soon as the temp falls below freezing... usually mid to late September in the higher elevations. Here are a couple of terms you may want to know about as we head into both the beginning of fall and the peak of hurricane season. —Invest: An invest is an area of disturbed weather in the tropics that the NHC (National Hurricane Centre) wants to take a closer look at. By designating an invest, special models will run, special satellite images will be taken and special analysis done by both computers and humans. Usually an invest is designated when it looks like a tropical system could form, but most invests don’t become tropical depressions or storms. Invests are nothing to panic over, despite the posts of scary looking maps you may see on social media. They are simply something to be watched. Almost always, invests either die out or develop into named systems before they impact Maine but if you have interest in the weather for tropical locations — like that Winter home in Florida — invest is a good term to know. —La Nina: As we head towards Fall, you will likely begin to wonder what the upcoming Winter will look like. You can find lots of chatter on this topic both online and at basically any gathering of people in Maine between the months of September and December. La Nina is likely to be one of the more talked about things with regards to the Winter forecast. La Nina is the opposite of El Nino. La Nina occurs when the waters in the equatorial east Pacific are cooler than average. It sets off a chain reaction that ends up favouring cooler and drier weather for Maine during the winter. The La Nina that is forecast for this year is likely to be pretty weak, which means that actual conditions are likely to be driven by other factors, such as Siberian snow cover, the NAO, the AO, the PNA and the whole alphabet soup of teleconnections I shall have to interpret for you in later columns. What do I think? 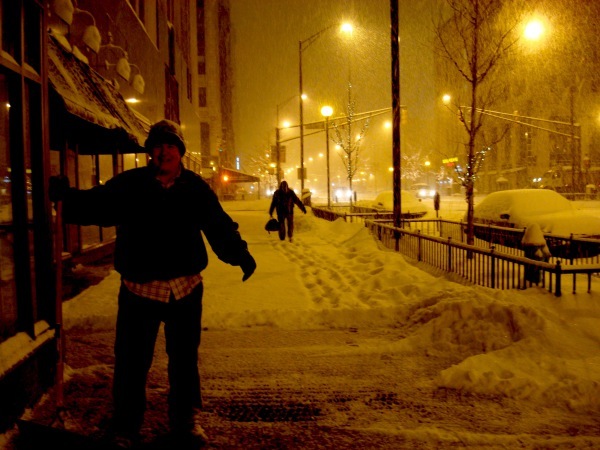 We’ll have more snow than last year and less than two years ago. Oh, and don’t listen to the Farmer’s almanac. They thought we would have another blockbuster Winter last year. How well did that work out?